Radio personality, comedian, film actor--Hank Penny wore a lot of show business hats. His chief claim to fame stems from leading an uncommonly innovative Western swing band; Penny was a capable vocalist and hired stellar sidemen. Born August 18, 1918 in Ensley, Alabama, just outside Birmingham, Herbert Clayton Penny learned his way around a guitar from his father before he was eight. He inherited his nickname of Hank from hillbilly bandleader Happy Hal Burns when he hired on at Burns’ WAPI radio show in Birmingham. He was smitten by the Western swing of Bob Wills and Milton Brown in 1936, soon forming his own outfit along the same lines, The Radio Cowboys. Art Satherley recorded the band in 1938 for Vocalion and again the next year with Noel Boggs on steel guitar and a young Boudleaux Bryant manning a fiddle. 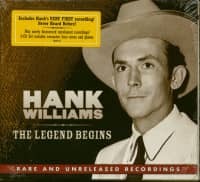 After a 1940 session for OKeh, Hank broke up The Radio Cowboys. He moved to Cincinnati in 1942 to perform on WLW radio and in 1945 signed with Syd Nathan’s fledgling King Records, where Penny scored C&W hits in 1946 with Steel Guitar Stomp (waxed in Hollywood with Boggs and guitarist Merle Travis) and the bawdy Get Yourself A Red Head. Bloodshot Eyes, his 1950 hit for King, was covered for the R&B market by labelmate Wynonie Harris. Remington Ride, a tour de force 1950 showcase for Penny’s steel guitarist Herb Remington, also had a second life at King when blues guitarist Freddy King waxed an amazing 1963 version. Basing his band in Los Angeles, Penny defected to RCA Victor in 1950. He had excellent taste in steel guitarists (Boggs, Remington, Speedy West, and Joaquin Murphy all rolled through Penny’s bands) and female singers, hiring a then-unknown Jaye P. Morgan and later marrying Sue Thompson. Hank hooked up with Decca in 1954. He cut Rock Of Gibraltar, penned by Bakersfield’s own Billy Mize, on April 5, 1956 at Decca’s own studios at 5505 Melrose in Hollywood, adapting easily to newfangled rock and roll (Tennessee Williams was listed as one of the writers on the flip, Southern Fried Chicken). Penny signed off at Decca in 1957 with the comedy record A Night At The Copa. Apart from a ‘59 LP for NRC and a handful of 45s during the ‘60s, Penny’s recording career petered out, but he was active musically for decades (he’d divorced ex-duet partner Thompson, a star thanks to Sad Movies [Make Me Cry] and Norman, in 1963). A heart attack ended Penny’s life on April 17, 1992. (2013 British Archives) 23 tracks 1940-57. (2004/KRAZY KAT) 28 tracks 1938-1941 with 24 page booklet.